Broadsands sea fishing mark in North Devon is a twisting descent down over 200 steps leads onto a steeply-shelving shingle beach that is sheltered from all but northerly winds. At the far end is a rocky outcrop that is cut off for around two hours at the top of each tide. The most easily accessed mark is called Back Rock. The walk back up may prove to be the only problem. The left-hand side of this outcrop leads to the Inner and Outer Stones, the first of which is only accessible for 90 minutes each side of a low water spring tide. Be careful to avoid getting cut off. The beach is unproductive, except for pouting, dogfish and a few good bass. The rock marks offer conger eels, cod, whiting, dogfish, rockling and huss in winter. The Outer Stone gives spotted rays. Bass, pollack, mackerel, garfish and wrasse are worth targeting in summer. Squid, mackerel and sandeels are good all-round baits during autumn and winter. Lugworms and squid cocktails for cod and whiting. 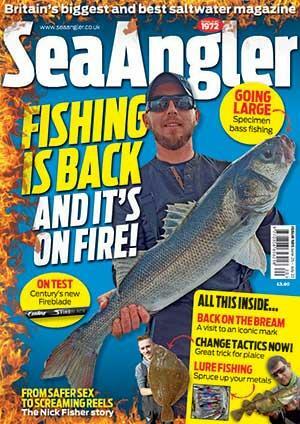 Artificial lures tempt bass and mackerel. Floatfished fish strip tempts garfish, mackerel and pollock. Peeler crabs take bass and wrasse from the rocky gullies. A light beachcaster will suffice from the beach, matched to a reel holding 15lb line. A simple two-hook paternoster will work to catch most species. The rocks demand a tougher outfit matched to 25lb line. A breakout lead weight is essential from the Outer Stone, which has very deep water and a strong tidal pull. A light spinning rod designed to cast up to 2oz suffi ces for float fishing or spinning. Follow the A399 from Combe Martin to Ilfracombe then turn right to Knapp's campsite opposite the turning to Berrynarbor. Go up the hill past the campsite and continue past the tarmac area. There is a gate on the left-hand side, park there and walk down the pathway and 220 steep steps on to the beach.